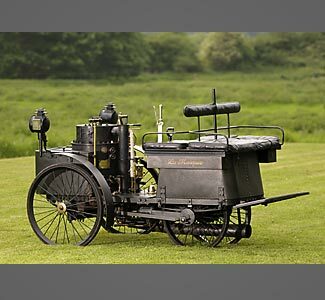 The world's oldest working car is set to go under the hammer - and it is expected to fetch up to £1 million. The four-wheeled car, called La Marquise, was built in 1884 for the Count De Dion, one of the founders of the automobile manufacturers De Dion-Bouton et Trepardoux. It has only had two other owners since, according to Gooding & Company, the auction house selling it. The four-seater, fuelled by coal, wood and paper, takes about half an hour to work up enough steam to go. In an 1887 race, La Marquise hit an average speed of 26 miles per hour on a 19-mile course. The following year it won the world's first motor race, beating out its three-wheeled competition, another De Dion-Bouton.The steam-powered La Marquise was built in France in 1884 by De Dion-Bouton et Trepardoux, one year before Gottlieb Daimler and Karl Benz each independently built their first gasoline-powered cars in German. Twelve years later, Henry Ford built his first automobile in the US. La Marquise is being sold by Gooding & Company, the California-based auction house, in August in Pebble Beach.